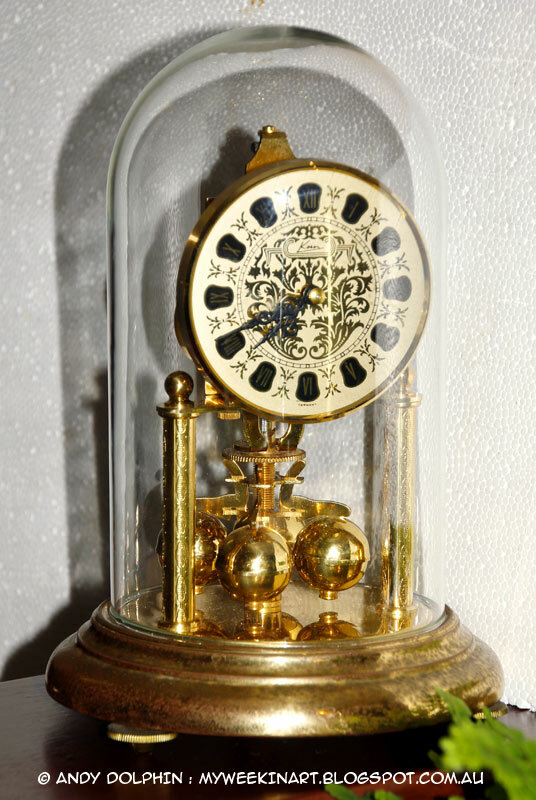 For years my wife, Janet, expressed her interest in “dome clocks”. We looked around from time to time but never saw any for sale in the places where we expected to find them. Then, a few months ago, I saw one at the local auction house. It was a genuine wind-up clock – though it was without a key. I had no idea if it would work or not, and I knew nothing about these clocks, but I got it cheap. At the very least it would make a nice ornament and I even foresaw the possibility of including it in a still life painting at some point. Once home, I set it up on the bookcase and tried to get it to work – without success. And so began my education in “400-day” or “Anniversary Clocks” (as it turns out they are officially called, because they only need winding once a year, in theory) and my fascination with these time-keeping devices was born. To cut a potentially long story short, the clock started working after a month or so, with just a little perseverance on our part. It’s been running mesmerisingly non-stop now for two months. 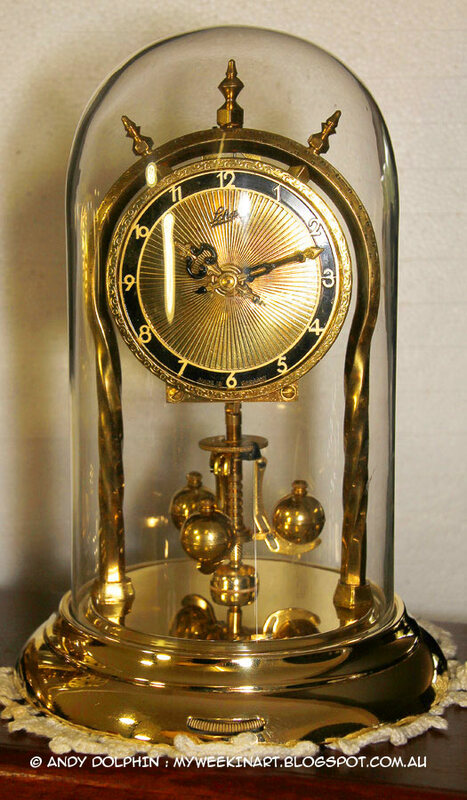 This, apparently, is something of a victory as these clocks are renowned for being exceptionally difficult to work with, to the point where many experienced clock repairers simply refuse to have anything to do with them. As a result, they are often found for next-to-nothing in thrift shops and flea markets. Shortly after buying this clock, I had discovered the location of another unwanted, unworking anniversary clock so I approached the owner and he gave it to me. A few parts were detached, but present, and the clock hadn’t run for a long time. It was clear someone had tried and failed to fix it. It’s early days for the second clock (life was not meant to be this easy when dealing with these devices and I know it has some deep-seated issues we’ll need to work through at some point) but we now have two “functioning” 400-day clocks. They are marvels of finely-balanced engineering and works of art, in a rather “steampunk” sort of way. I’m not usually mechanically inclined but something about these clocks appeals to my inner-geek. I have a need to learn everything there is to learn about what makes these things tick, if you’ll pardon the obvious pun, but the two clocks we have are behaving too well to risk upsetting them.